I’ve never claimed to have my act together. I’ve been working outside of my normal office for most of December and it has really thrown my schedule out of whack. And you already know that I can be a little OCD about personal correspondence. Some other things (like keeping my car clean) not so much. I mentioned last time that I bought a Groupon for 100 flat cards from Vistaprint for only $32 with free shipping! It was a great deal!! Well, imagine my dismay when I spent two nights debating over which design I liked best only to find out that to get the cards before Christmas it was going to cost an additional $17-$28 in shipping depending on whether I did the 3 or 7 day shipping. The standard shipping which was free with the Groupon was for delivery in 14 days. Chad has often called me “frugal.” And I guess he’s right. I’m also an Accountant by trade and I can’t stand to waste money. It irritates me. I don’t mind spending it if I feel like I’m getting a good value for my money but I don’t want to spend almost as much on the shipping as I did on the product. That is crazy talk. So I decided to risk it and do the standard shipping. I ordered another order from Vistaprint 36 hours before the cards with standard shipping and it had already shipped. So I thought it would be fine. Fast forward five days and my order is still “in progress” – meaning it hasn’t shipped yet. I’m starting to get really nervous. I’m checking the status first thing in the morning, at lunch, on the drive home, and during the night. My OCD is in overdrive. I’m getting desperate at this point. I call customer service to see if I can upgrade the shipping. They don’t allow that. You have to cancel the order and re-order. So I canceled my order. But for some reason they still are sending them to me. They’re currently somewhere around Columbus, Ohio and expected to arrive on 12/26. What am I going to do with 100 Christmas Cards on 12/26? Then I resorted to plan B and ordered photo cards from Walgreens and they were ready in 12 hours. They turned out pretty cute and I got lucky and found a 50% off coupon code on Retail Me Not. The picture is a little blurry because I had to get it from a print screen but you get the idea of the finished product. So the moral of this story is three-fold. 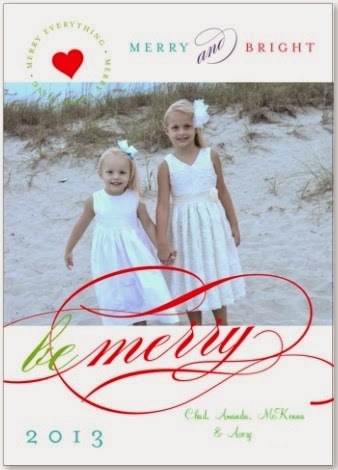 If you are going to order Christmas cards from Vistaprint and don’t want to pay exorbitant shipping fees, order early. Don’t waste two days trying to decide on a design. Just pick one and roll. If it’s not early and you still decide to order, go ahead and pay the extra shipping. Don’t risk it. It’s too stressful and you might end up driving to Walgreens in the middle of the night to pick up your Christmas cards five days before Christmas. All’s well that ends well and hopefully the second batch that I mailed will arrive at a mailbox near you today! I’ll be back really soon with pictures from the Christmas Musical at my church last night. It was so cute!